1. Warm olive oil in a large pan over medium-high heat. Trim off excess icky fat from your chicken thighs, but keep the skin on. Salt and pepper both sides liberally. 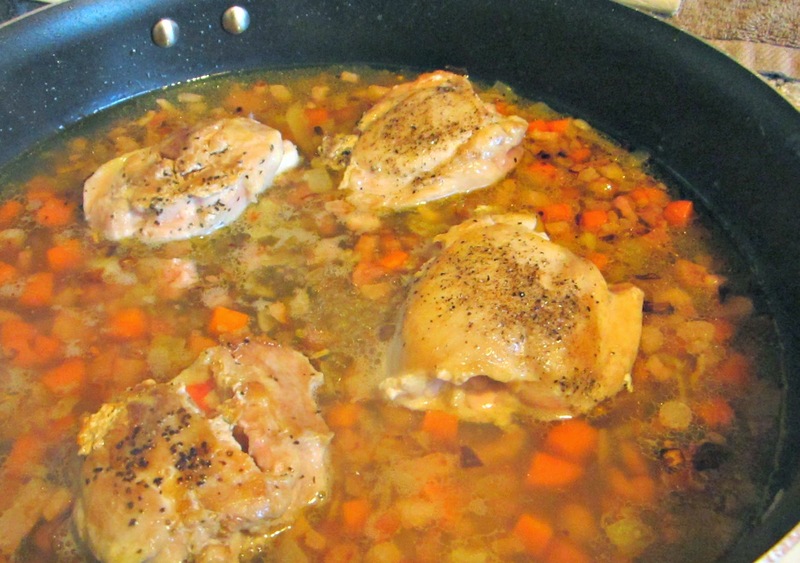 Once oil begins to shimmer and air above pan feels hot, pop chicken thighs into the pan, skin side down. If you don’t hear the happy sizzling sound, your pan is not hot enough. Pull the thighs off and wait a moment or two more before adding them back to the pan. Sear thighs for 3 minutes each side and then remove from pan and set aside to rest once the skin has a lovely golden color. 2. In the same pan, saute pancetta until slightly browned, about 10 minutes over medium heat. Stir frequently. Add carrots, saute for 2 minutes, then add onions and garlic. Saute veggies together until carrots are almost tender. Add rosemary and thyme and a pinch salt and pepper. Go easy on the salt here because the pancetta will be already lending its salty goodness to the veggies. 3. Add chicken stock carefully. Depending on the heat of your pan, you may get a dangerous breed of insta-boil stock and it could fly out and try to attack you. Scrape bottom on pan to make sure all the browned bits are incorporated into your sauce. Simmer for about 5 minutes and then add chicken back to pan for its sauce bath. 4. Cook chicken, in simmering stock for 10 minutes or when chicken is cooked through. Don’t worry if you have to cut a thigh to make sure its done, when you put all the yummy veggies on top, no one will be the wiser. 5. Once cooked through, remove the chicken and place on its bed of pre-cooked couscous or orzo to rest. 6. Add milk/half-and-half to stock, stir to incorporate and simmer until the sauce is reduced by half. Spoon veggies and lots of sauce over chicken and couscous/orzo. 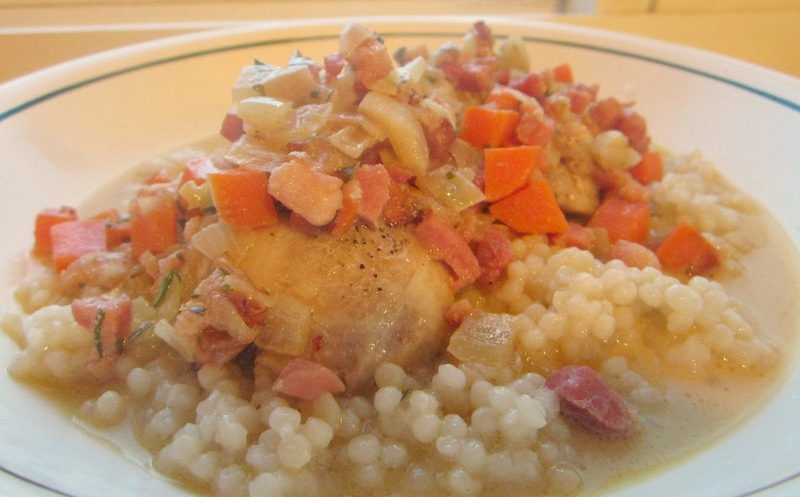 Revel in your fricassee mastery and enjoy! !